Tickets can be purchased onboard the train or online before boarding. 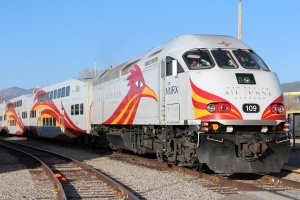 Rail Runner Express is a commuter rail service between Belen and Santa Fe via Albuquerque. It connects with local transit in various cities including ABQ RIDE, Rio Metro, and Santa Fe Trails. Bicycle can be carried on board the train through doors marked with bicycle emblem. Store bikes at designated spaces only in the lower level. Each rail car has space for up to 8 bikes. Do not store bikes in areas designated for disabled riders. Rail Runner Express is accessible to people with disabilities at all stations. Riders with mobility device should wait on top of the mini-high platform by the north end of the station. To board those trains, conductors will deploy a ramp to bridge the gap between the vehicle and the mini-high platform.